Do you need a security gate or barrier gate for your Tulsa property or business? Tulsa Home Guard is your source for security gate installation. For over 30 years, we’ve been securing homes and commercial properties with custom built iron gates. Specializing in Doorking™ products, Tulsa Home Guard has an experienced team of technicians committed to give you the security and the peace of mind you desire. Our gates are manufactured to your specifications. You tell us the design, the style, the measurements, and the security features you are looking for, and we will create the perfect gate for you. You can also choose the type of operation based on your space and your needs—your gate can run by hydraulic, mechanical, solar, or electromechanical power. 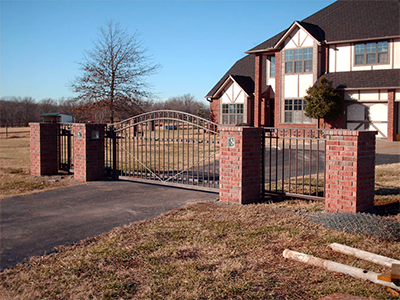 In addition to providing industrial-quality and top-performing gates, Tulsa Home Guard is constantly looking for ways to improve our products. The access controls to our gates, which include keypads, card and proximity readers, and telephone entry systems, are all equipped with leading edge technology. We have an exceptional support team waiting to give you any technical assistance you require. Whether you are a business owner, project manager, homeowner, or landscape engineer in Tulsa, you can be confident in our expertise, friendliness, and desire to help you achieve the highest level of security you can! Contact Tulsa Home Guard at 918-584-4923 for a free, no-obligation consultation. We can come to you and discuss your desires for your property. Don’t take chances with your security. Let us help you today!